You know the feeling you get when you finish a novel and you just know that you’ve had one of the best reading experiences of your life? Well, take that feeling, multiply it by infinity and what you’ll get is how I felt when I finished Warcross. I loved, loved, loved this novel so damn much. So much so, in fact, that I immediately preordered it, told three different people to read it and could not stop talking about it every single time someone brought it up during Book Expo and BookCon. I still haven’t stopped talking about it, and I probably won’t because it was just that brilliant. But before I get to telling you what I loved about Warcross, I should probably tell you what it’s about. Emika Chen is struggling to make ends meet day-to-day, both as a waitress and as a bounty hunter who tracks down the criminals the police don’t have the resources or time to capture for cash. When her need for cash becomes life or death, Emika does the unthinkable – she hacks into the opening game of the international Warcross Championships and accidentally glitches herself into the action. She can hardly believe it when Hideo Tanaka, creator of the Warcross game, doesn't give her grief but instead gives her the opportunity to come to Tokyo to work for him as a spy-slash-player amidst the teams in this year’s Warcross tournament. Her mission? To discover the person that threatens to be a security problem for the game. But what Emika doesn’t expect is to discover a sinister plot during her investigation that will have effects that reverberate through the entire Warcross community. I will be 100% honest: I have not loved all the Marie Lu novels I’ve read. I binge read and enjoyed the Legend trilogy; I read The Young Elites but never continued with that series. 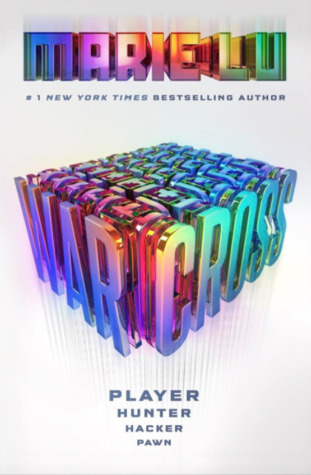 But when I heard what Warcross was about, I couldn’t pass up the opportunity to read this -and I’m glad I didn’t, because it is one of my favorite books ever. The premise promises a story that is exciting and compelling, and Lu delivers on both counts. It’s a science fiction mystery, set in a world where a virtual reality game is a part of majority of the population’s everyday life (much like Sword Art Online, which is one of my favorite animes of all time). I loved the way the plot unfolds – the mystery, the relationships, the games. I loved the setting – New York and Tokyo and the virtual world within the Warcross game. I loved the action scenes; I loved the swoony moments; I loved the flashbacks. It’s probably making me sound like a broken record, but friends, the truth is that I just loved this novel. As Emika races against time and danger to figure out what exactly is going on and who is behind it all, I was completely invested in the outcome alongside her. Lu makes it easy to root for her, both by making Emika so relatable in her determination to survive independently and to take her chances when she can get them and by revealing portions of her past as the story goes on. She was smart and capable, vulnerable and kind, stubborn and independent – and I absolutely adored her. I was also a big fan of the secondary characters – Warcross creator (and major crush for me) Hideo Tanaka, and the Phoenix Riders (Emika’s team during the championships) made up of Asher, Roshan, Ren and Hammie) especially – because Lu does a bang-up job making them memorable. If I could broadcast to the entire universe how much I adored Warcross, I would do it without hesitation. It might not be the perfect book, but it was perfect to me – whether we’re talking about premise, characters, world, plot, pacing, writing or any other element of this story. It’s fun. And exciting. And smart. And impossible to put down once you start. It’s an adventure that I’m fortunate enough to have experienced with Lu at the helm, and I look forward to the sequel (and deeply grieve that I’m now going to have to wait over a year to read it).